1. Preheat oven to 325 degrees. Butter two 5-by-9-inch loaf pans. Combine 3 1/4 cups flour and salt in a bowl. 2. Cream butter, sour cream, and sugar with a mixer on high speed until pale and fluffy, for 8 minutes. Scrape down sides of bowl. Reduce speed to medium, and add vanilla extract. 3. Lightly beat eggs with the Lemon Extra Virgin Olive Oil, and add to mixer bowl in 4 additions, mixing thoroughly after each and scraping down sides. Reduce speed to low, and add flour mixture in 4 additions, mixing until just incorporated. Divide batter between pans. Tap on counter to distribute; smooth tops. 4. Before baking, sprinkle sanding sugar over each cake. Bake until a tester inserted into center of each cake comes out clean, about 65 minutes. Let cool in pans on a wire rack for 30 minutes. Remove from pans, and let cool completely on wire rack. In the bowl of a mixer, whip cold cream to light peaks. Add sugar and vanilla and mix until well incorporated. Cut one pound cake loaf in to one inch cubes. Add 1/3 of the pound cake cubes to the bottom of your trifle dish. Use a pastry brush to dab Ripe Peach White Balsamic on to the pound cake. Next, layer with 1/2 cup of lemon curd. 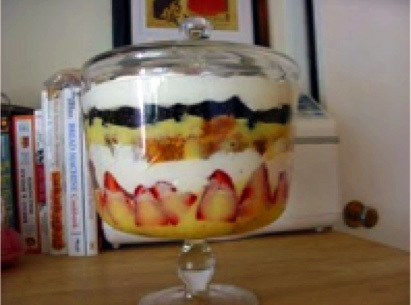 Arrange 1/3 of the berries decoratively along the perimeter of the trifle dish, covering the layer of lemon curd. Add 1/2 cup of the chilled Chantilly cream over the berries. Repeat these layer two more times ending with a layer of Chantilly cream on top. Allow the trifle to rest, covered and chilled, for three hours before serving Garnish with fresh berries and a mint sprig.